We all get sore after a good workout. While stretching is necessary, we should also be mindful of the food we’re putting into our body post-workout. Watermelon is deliciously refreshing but can it help with soreness? Michael T. Murray, author of THE MAGIC OF FOOD, shares why we should eat more watermelon. While medicine has focused primarily on watermelon’s diuretic effects, research indicates that drinking watermelon juice is a postworkout remedy that can help reduce muscle soreness. Watermelon is an excellent source of the amino acid citrulline, which the human body converts to arginine and nitric oxide, a key regulator of blood flow. Available as a dietary supplement, citrulline is showing benefits in treating Alzheimer’s disease, dementia, fatigue, muscle weakness, erectile dysfunction, high blood pressure, and diabetes. Many of these effects are also achieved with arginine supplementation. The advantage of citrulline over arginine is that it provides a more prolonged boost in blood arginine levels. The same may be true of watermelon juice. In a small study conducted at a Spanish university, researchers monitored seven athletes after they exerted maximum effort on a stationary bike. On different days, the athletes were supplied with 500 ml of natural watermelon juice (1.17 grams of citrulline), enriched watermelon juice (4.83 grams of citrulline plus 1.17 grams from watermelon), or a placebo. Results showed that both of the watermelon juices helped to reduce the recovery heart rate and muscle soreness after twenty-four hours compared to the placebo. The study seems to indicate that the citrulline from watermelon may be better absorbed or utilized than that from a supplement. In another part of the study, the researchers used a laboratory model to compare the absorption of citrulline from unpasteurized or pasteurized watermelon juice compared to citrulline as a supplement. The result showed that the bioavailability of citrulline was greater in the raw juice than either the pasteurized juice or the solution containing citrulline. These results show the advantage of drinking fresh fruit and vegetable juices. Watermelon is cooling and refreshing. Eat pieces of watermelon or juice it with other ingredients. When you’re sore it’s important that you give yourself proper recovery time. We’ve rounded up a few workout tips to try when you’re sore. 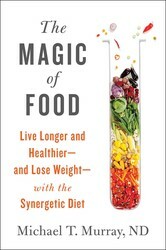 Excerpted from The Magic of Food by Michael T. Murray, ND. Copyright © 2017 by Michael T. Murray, ND. Used by permission of the publisher. All rights reserved. The world’s most renowned doctor of natural medicine, co-author of The Encyclopedia of Healing Foods and The Encyclopedia of Natural Medicine (Third Edition), Dr. Michael Murray draws on his extensive knowledge of food as medicine to promote optimum health. Food affects our body, mind, and health in many remarkable ways. And certain foods work together in ways that are almost magical. In this groundbreaking new eating plan, Dr. Michael Murray identifies foods that act together to produce a total effect or force that is greater than the sum of the individual foods—what is known as a synergetic effect. Research shows there’s a tremendous synergetic effect that the healing force of nature exerts through each food and each food component. As the foods work together, they improve your energy and your physical and mental health. Michael Murray’s years of research and clinical experience have led to a definitive understanding of how specific foods affect us. He presents his findings on phytochemicals and other nutrients and why they’re the new “vitamins”; discusses specific healing foods and how to combine them; and explains the principles to follow for eating the most synergetic foods every day. Here also are practical and prescriptive recipes and helpful guidelines for better and delicious eating. All this is in a usable, accessible, entertaining guide that you will turn to again and again as you develop your own personalized program for using food as medicine. Michael T. Murray, ND, is a doctor of naturopathy, a field of alternative medicine that seeks to harness the power of nature to prevent illness and achieve the highest level of health possible. He is the author of more than thirty books, including the acclaimed bestsellers The Encyclopedia of Natural Medicine (Third Edition) and The Encyclopedia of Healing Foods (co-authored with Dr. Joseph Pizzorno).